Almost exactly a month ago, Microsoft launched Internet Explorer 11 as part of the Windows 8.1 preview and today, it is also launching a developer preview of IE11 for Windows 7. IE11 is Microsoft’s first browser to embrace the WebGL standard for accessing the computer’s GPU for rendering advanced 2D and 3D experiences. As Microsoft’s senior program manager for IE Frank Olivier told me, his team has worked hard to ensure that WebGL in IE (both on Windows 7 and 8.1) is as safe as possible and can’t crash the system (it does, after all, allow very low-level access to your hardware). Indeed, Olivier showed me a demo that stressed IE11 s WebGL implementation to the point where it crashes. IE11 handles this situation gracefully and simply restarts its WebGL core as needed. To show off IE11 s WebGL features, the company teamed up with GlacierWorks, a site that aims to raise awareness about the effect of climate change in the Himalayas, to add more WebGL content to its site. All of these features will also be available to Windows 7 users and Singhal expects the Windows 7 version to offer virtually the same performance as on the new operating system. One feature Microsoft doesn’t bring to Windows 7, though, is support for Google’s SPDY networking protocol. As for Windows 8, Microsoft tells me that it will ship IE11 with the free Windows 8.1 upgrade. Microsoft clearly expects most Windows 8 users to upgrade to 8.1 and it doesn’t look like it plans to make IE11 available as a standalone download for 8. With today’s update for Windows 7, Microsoft is also updating modern.IE, its site for tools and resources for developing for IE. 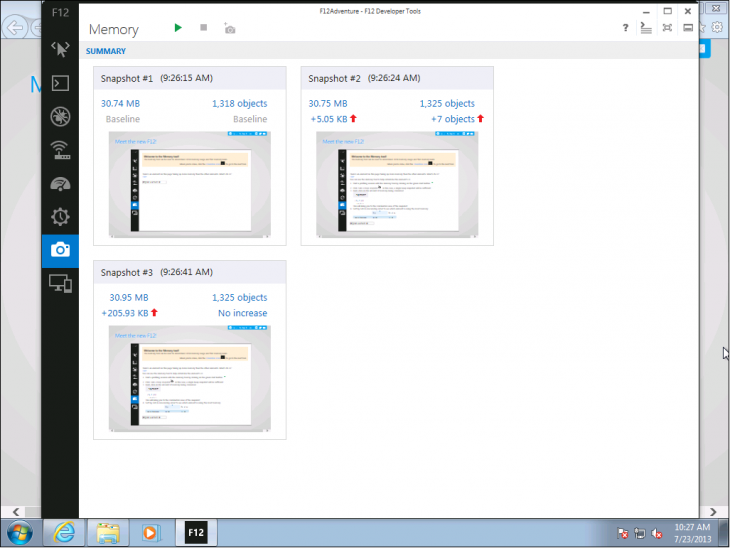 The site now features virtual machines for testing IE11 on Windows 8.1 and Windows 7, as well as a new screenshot tool that lets you see how your sites look across different browsers and devices. For a limited time, Microsoft is also offering developers a 25 percent discount on Parallels for Mac so they can run these virtual machines. 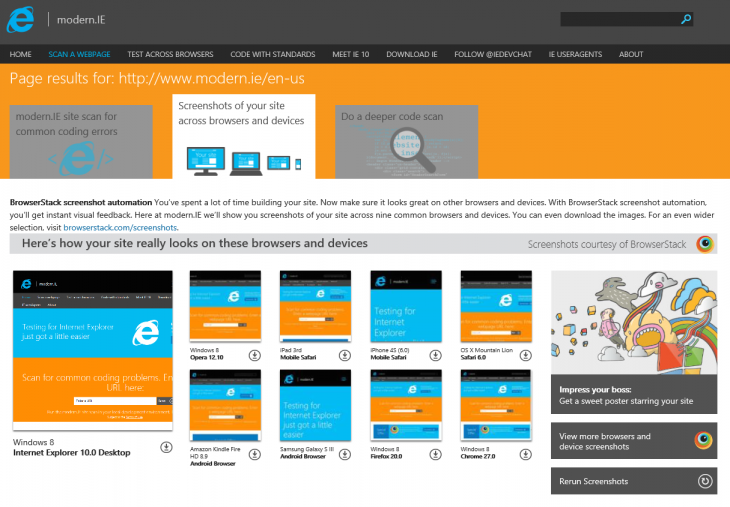 IE11 itself, it’s worth noting, also includes a number of updated developer tools. According to an internal memo sent this morning to employees, top Skype exec Mark Gillett is leaving Microsoft. Sources said that Gillett – who is corporate VP for Skype, as well as its Lync communications product – has another job he is headed to, although the memo did not mention where he was going. Gillett, who is responsible for Skype’s product, engineering and operations worldwide, has been with the online telephony company for several years, including before Microsoft bought it. Previous to that, he worked at private equity giant Silver Lake in Europe. Last month, we sat down with Microsoft for a quick look at the Xbox’s upcoming Dashboard update – it was sleek, searchable, and extremely camera shy. A quick trip to Europe seems to have cured it of its bashful ways, however, and the budding update can now be seen in a slightly blurry piece of French cinema. This leaked video shows a Dashboard with a smidge more polish than the demo we saw in September, and silently plods on without so much as a bleep or bloop. Our mute host briefly peeks at the Xbox Live Marketplace, casually glances at the Bing search page and scrolls leisurely through the new Dash’s very Metro menu. The whole shebang is en fran ais, of course, and the update’s snappy voice-control gimmick is sadly absent. Sure, there’s not a lot of depth here, but if you want a glimpse of what’s coming when the update drops later this Fall, it’s definitely worth a look. Investor confidence in Nokia appears to be on the upswing. A narrower third-quarter loss and an upbeat forecast from the mobile phone company pushed its shares up eight percent Tuesday morning. And, indeed, there is good reason to celebrate Nokia’s third-quarter earnings. The company once again posted an increase in sales of its Lumia smartphone, shipping 8.8 million of them during the quarter. That’s a nice bump up from the record 7.4 million it sold in the quarter prior, and a vast improvement over the 2.9 million it sold during the same period a year ago. Another highlight: Nokia’s handset sales in North America. There, the Finnish company recorded sales of 1.4 million units in the third quarter. That’s nearly triple the number it sold in the second quarter, and far more than the 300,000 units it shipped in the year-ago period. Now, 1.4 million smartphones shipped in North America isn’t exactly a triumph in absolute terms – companies like Apple and Samsung shipped many, many more – but it’s progress, and a promising development for Nokia’s device business, which is to be acquired by Microsoft early next year. Great news for the software giant, which is paying $7.2 billion for it in the hope that Nokia’s smartphone expertise will make Windows Phone relevant in a market dominated by Google’s Android and Apple’s iPhone. Microsoft is cutting the price of the Xbox One to 399.99 in the UK, as it seeks to stimulate sales alongside its highly-anticipated first person shooter exclusive Titanfall. The reduced price tag will take effect this Friday (February 28), exactly two weeks before the new title from Respawn Entertainment hits store shelves in the region. While stocks last, Microsoft will also throw in a free copy of Titanfall if you pre-order the title alongside a new Xbox One. That means you’re picking up the console for 30 less, with a full-price game (anywhere up to 50) for a grand total of 80 in savings. The new Titanfall bundle will also be available in the US, although Microsoft will be sticking to its original price of $499 for the Xbox One. While the Xbox One is selling well, in these early months it’s started lagging behind the PlayStation 4 in crucial markets such as the US. While sales figures for the UK haven’t been broken out, this would suggest Sony is building a significant lead – or that Microsoft is at least worried that it’s about to do so. Titanfall is arguably the Xbox One’s biggest exclusive so far, so it should come as no surprise that Microsoft wants to maximize its potential to tempt new customers away from its closest rival. It’s hard to believe that it was ten years ago today that Windows XP first hit retail shelves. It’s even more astonishing when you realize that it was still the most popular operating system in the world until the beginning of this month. The sun may finally be setting on the stalwart OS that has powered countless home and business PCs (it crossed the 400 million mark way back in 2006), but it’s still number two – right behind it’s youngest brother Windows 7 and well ahead of the black sheep, Vista. Sure, our relationship with Microsoft’s OS has had its ups and downs, but it’s clear we’ve developed an attachment to the ol’ bird. After all, consumer demand kept it shipping on PCs until late 2010 and Redmond has pledged to support it until April 8th of 2014. If nothing else, XP will be remembered for its incredibleresilience.